All journeys follow a path and in some cases become part of a timeline. This journey follows both, but let's start with the road. The history of developing roadways resonates strongly with South Carolinians, especially in the heartland of our state. During the mid-1900s, U.S. Highway 301 - known to travelers as the Tobacco Trail, The Highway of Hospitality and later, Miss Universe Highway - was quite a busy thoroughfare for commerce and tourism in South Carolina. Eventually connecting the Eastern seaboard states all the way from Florida to Delaware, Highway 301 conveniently funneled streams of cars and trucks along a picturesque 190-mile tour of our state's epicenter, passing through Dillon, Santee and Allendale. Friendly diners and colorful motels dotted our country roadsides to tempt passers-by with an ice cream soda or a comfortable night's rest. With the dawning of faster-moving interstate roads, Highway 301 traffic slowed to a trickle over time, leaving ghostly remnants of an era gone by. Although expressway travel eventually won out, Highway 301's slower pace continues to hold on to its faithful followers - and there are many of us who admittedly find an odd sense of comfort in driving past the run-down motels and faded neon signs. Today, traveling 301 through Allendale County toward the Savannah River, the tranquil farmlands, pastures and forests envelop visitors with a breath of fresh air. 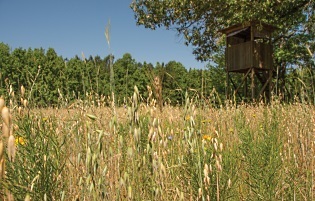 The thriving agribusiness communities, parks and nature trails offer respite from city life, and an instant reconnect with the outdoors. And just before the river, Butterfield Plantation's bright white sign signals a warm hello. The trip to Butterfield Plantation is more than a nostalgic drive down a once bustling highway. The twists and turns go on a journey back in time to the 1850s. Following the rush for gold out West, the infrastructure of the country's road system was racing to catch up with ever-shifting populations of people. The need for basic communication and fresh supplies between towns, with vast stretches of land between them, demanded horsepower - and not the kind you'd find under the hood of a truck. We're talking about horses and mules, and lots of them. In response, the Post Office Department awarded a contract in 1857 to the "overland" mail stage line of John Warren Butterfield. Using "good four-horse coaches or spring wagons, suitable for the conveyance of passengers," the stagecoaches would relay their deliveries from stage to stage along the 2,800-mile "Oxbow Route" between Tipton, Missouri, and San Francisco, California. Butterfield hired hundreds of rugged frontiersmen who were tough enough to safeguard mail and navigate a stagecoach through some of the most treacherous and isolated regions of the country, and employed more than a thousand staff to maintain the route and man the stations. The historic first delivery of the Overland Stage Mail Service was launched on September 16, 1858, and John Butterfield Jr. proudly drove the first leg of the route. Along for the ride was twenty-three-year-old New York Herald reporter Waterman Ormsby, who was assigned to chronicle the entire 2,800-mile stagecoach route. When Ormsby finally arrived in California, he wrote, "Had I not just come over the route, I would be perfectly willing to go back, but I now know what Hell is like. I've just had twenty-four days of it." Although Butterfield's stagecoach company was eventually pushed out and replaced by Wells Fargo, the legacy of Butterfield's Overland Stage Mail Service is unparalleled as it paved the way for modern communications, delivery services and many of the transportation routes we have today. During the 1920s, one of Butterfield's descendants and her husband ventured into the South Carolina town of Allendale, by way of a road that would in time become a section of U.S. Highway 301. The young couple decided to build a plantation home just off this road and a short distance from the Savannah River to entertain guests with an abundance of hunting and fishing. 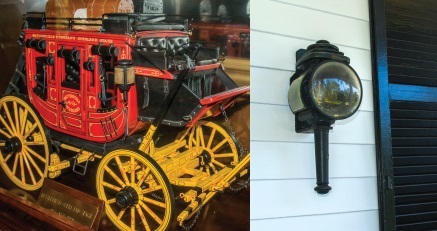 They proudly mounted two Butterfield stagecoach lamps on either side of the front door, welcoming family and friends who traveled long distances to visit the stately 5,200-square-foot plantation home. Known through the decades as Butterfield Plantation, the plantation home and surrounding 1,700 acres has changed hands just a few times - most recently owned by Michael Trezevant Finch, who purchased the property in 1990. And as this timeline continues to unfurl, Finch's fascination with history, his appreciation for the outdoors, and a certain affection for untamed lands has kept alive the legend and adventurous spirit of Butterfield through a rural plantation securely tucked away along Highway 301 in Allendale. Growing up on his father's dairy farm in Dixiana in the 1940s and '50s, Finch developed a keen interest in raising cows and a fascination for all things outdoors. "My father had a big dairy," Finch reminisced. "Raising dairy cows, it was sometimes my job to catch the newborn bulls. I chased one calf half a mile!" He would carry those memories with him as he started his business career and migrated from the Midlands to the coast where future ventures awaited. Finch joined his brothers Henry and Raymon Finch Jr. in developing and managing Charleston's Wild Dunes Resort until 1984. 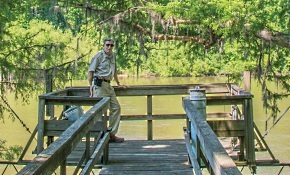 Then he switched gears with the purchase of South Tibwin Plantation in McClellanville in 1985, and maintained that property as an outdoor haven. Tibwin fueled Finch's enthusiasm for natural history and outdoor recreation, but the property, bound by U.S. Highway 17 and the Intracoastal Waterway, was hit hard by Hurricane Hugo in 1989, forcing Finch to part ways with the land. 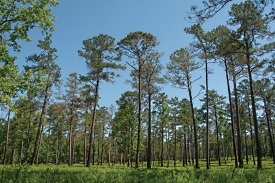 He decided that Tibwin would be best repaired and cared for by the U.S. Forest Service, with portions now cooperatively managed by the U.S. Forest Service and the SCDNR. Finch soon heard another property whisper his name, this time in Allendale County where he discovered Butterfield Plantation. He purchased the land in 1990, and from that day on, he never looked back. Recalling time spent with his father on the dairy farm, Finch decided to raise a few longhorns on the plantation. "The pasture could carry two longhorns and a few horses. They were nearly wild because they had never been penned up," he said. In addition to caring for the horses and cattle, Finch made it his mission to plant food plots for wildlife and tend to the ponds and fishing holes. 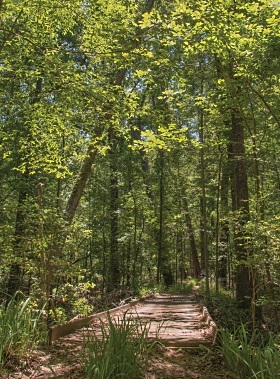 He and his wife Carmen enjoyed hiking the perimeter of the plantation whenever possible, walking among the ancient cypress trees in the swamps, and through planted fields and fern-covered forest floors many times over. On the trail loop, Finch had all of his favorite spots picked out. He implemented a system of low-impact boardwalks and piers so that visitors could immerse themselves in nature. His three children and all the grandchildren gathered at Butterfield as often as possible to cook out, fish and boat on the Savannah River, and hunt whenever they could. But, the rules were the rules. "Dad's quality deer management program has no boundaries," his son Mike Finch Jr. explained. "Even grandchildren are not exempt. They are each allowed one marginal eight-pointer when they first start hunting, then that is it. My daughter shot a second marginal buck - eight points, but one side was not outside the ears - and she was on ‘Deer Probation' the entire following season. Hogs only!" "He even put up signs with an ATV with a red circle and a line through it on certain trails to try to keep his unruly grandsons out of those areas - to keep quiet for game." Mike joked. Inevitably, he would spot an ATV track in those areas and I - their father - would get a call at the office on Monday about the trespass!!" "Yes, my husband James has been on the deer restriction as well!" Finch's daughter Meg Harrison added with a chuckle. "When I was a little girl and a thunderstorm would come along, he [Finch] would come find me in the house and we would head out to the front porch. I would sit in his lap and watch the storm go by. He would talk to me about not being afraid of the rain, thunder and lightning but appreciate its purpose and the reason it occurs. It is a very special memory that I have with him and remember being fascinated by all that he knew and taught us along the way." As with Ormsby's narrative of Butterfield's first stagecoach delivery back in 1858, I had the good fortune to ride alongside Michael Finch Sr. on a sunny day in May - to write about the rich history and riparian topography of Butterfield Plantation, and to learn more about Finch himself. "It's quiet back in here," Finch said. "Most people around don't know about this place. Some of the neighboring properties are more into planted pines, but not on Butterfield. It's strictly recreational, and we've never intended to harvest timber here. We have an oasis." Negotiating Butterfield's narrow dirt roads with the truck windows down, Finch pulled over to point out one of the many deer stands on the land, taking time to check over the adjoining field. "In the spring as soon as the buds start coming on the trees and the deer start eating browse," he explained, "they will totally ignore the [wheat and rye], and it will still come back and make that crop. And everything loves that. Turkey and deer, everything eats it. You don't have to plant it but once a year, and you've got it two seasons, the fall and the spring." Continuing the loop and approaching the Savannah River, we admired the photogenic beds of saw palmettos growing amidst the massive hardwoods. "All the wetlands come down through a creek into the old dead riverbed," he said. Signs of wild hogs, deer and raccoons were patterned in the mud. The Savannah River was waiting for us at the furthest part of the loop, flowing at a comfortable pace toward the ocean, as it has been for centuries. Finch recalled overnight adventures at the small lodge sitting atop the steep riverbank. With much more to see, we moved on, transitioning from one habitat type to the next. Finch stepped out of the truck further down the road, eager to unveil some of the hidden gems of the forest. Before I could get a foot out the door, he was off into the swamps with his walking stick. "Similar to the great cypress trees found in the Congaree National Forest, there are two down in here with the tops broken off [most likely by hurricane force winds] - one about forty-eight feet around and the other standing nearby, thirty-eight feet around." 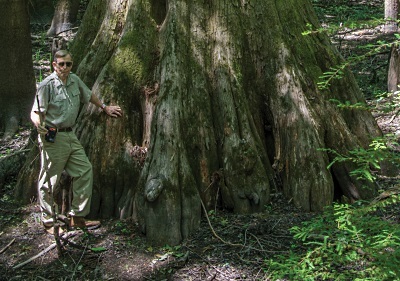 He made his way down into the swampland to stand next to one of the most magnificent cypress trees I had ever seen. The tree was estimated to be about fifteen hundred years old, and if it had not been for the missing treetop, would most likely be in the record books, according to Finch. As we returned to the truck, he talked about the evolution of this swampland, where tributaries of the Savannah River once flowed. "Oxbow lakes form over hundreds of years, and over time silt settles in the entrance. The evolution of the oxbow lakes and cypress swamps takes thousands of years to complete the process." The road circled to intersect with a raised dike that at first glance seemed out of place. "There is an old mill pond in the middle of the swamp," Finch said. "The dam is about ten or fifteen feet high. There are trees back in there that are about 120 years old. Virgin forests were cut in the 1890s or around 1910 when there was a big sawmill on the next property." He said that he had found railroad spikes in that area, most likely from a timber tram going to the railroad. Ending our tour with a final walk through the plantation home, Finch pointed out many of the historical photographs and maps that lined the walls, and most proudly stopped to talk about the Butterfield stagecoach replica on display in the foyer. "Nobody has ever lived in this house full time," Finch said. "The [young couple] from New Jersey who built the house, would come down in late September, then they would cover everything in white sheets and go back North in April or May." Going back further in time, Finch shared that he would occasionally find pottery and arrowheads around the property and in a grassy field where there was once an ancient sandbar. 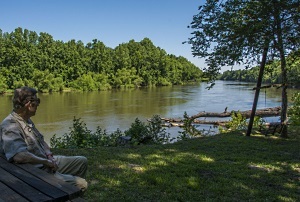 His commitment to maintaining Nature's landscape at Butterfield Plantation has through the years encouraged visitors like me to draw connections to the past, when earlier civilizations lived along the shores of the Savannah River. Through ongoing archaeological excavations a few miles upstream, extraordinary findings have been recorded along the Savannah River that suggest people have lived here much longer than previously believed. Radiocarbon dating reveals that humans may have been in South Carolina dozens of millennia before the end of the last ice age. There exists in each of us a connection to land that, in today's world, we may sometimes overlook or disregard when distracted by the electrical hum that cloaks our thoughts throughout the day. Whether we plant a seed or develop an oasis is our choice to make. The roads we carve out and the progress we make are continually etched into the landscape beneath us. And as the mountains form and weather away and waters rise and recede, what fingerprint will we leave for future generations to discover and record? 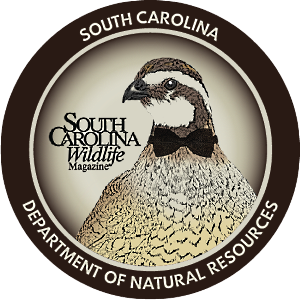 The SCDNR strives to work with other agencies, organizations and private landowners to protect the natural character of landscapes through sustainable management on private and public lands, ensuring that traditional land uses such as farming, silviculture, hunting and fishing will continue for generations to come. Today, there are twelve Focus Areas designated in the North American Waterfowl Management Plan for the Atlantic Coast Joint Venture for the benefit of all native plant and animal species. 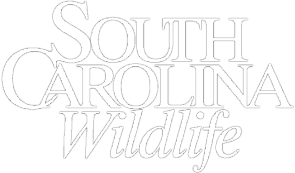 Many of these Focus Areas, such as the ACE Basin, COWASEE, Santee, and South Lowcountry, establish networks with private landowners, non-government and government entities to provide connectivity between lands for the future health of native plant and wildlife species. 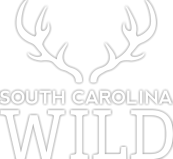 Dedicated to Michael Trezevant Finch, 1941 to 2017, and all of South Carolina's conservationists who devote their lives to protecting the wild lands of our state.